To participate in the Hackathon requires a substantial sacrifice of time and energy. Participants arrive at the conference a day early and commit to several hours of intense work with people they’ve just met to code a new product together. However, the end result is well worth it in terms of friendship and community building. 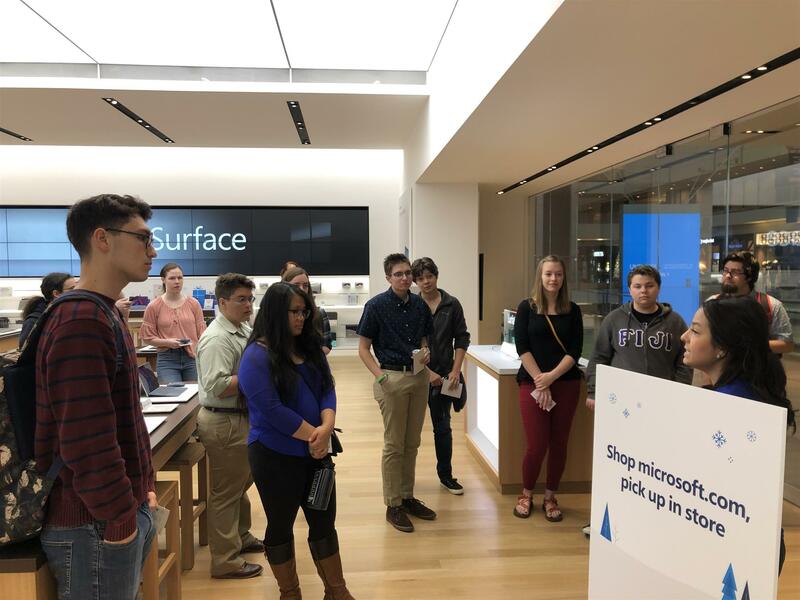 Participants enjoy a tour of the Microsoft Store in the Westin Galleria Mall. We kicked off this year with a visit to our sponsor, the Microsoft Store in the Westin Galleria Mall, who hosted us for breakfast, gave us a quick tour, and sent us away with prizes for our winners! Our Hackathon and conference wouldn’t be possible without our sponsors like Microsoft. I was particularly struck by the understated “the future of coding is female” canvas bags they sent us away with as prizes. After proper caffeination (critical to any technology event! ), we assembled in the hacking space and got started. Our hackathons welcome any of our members who want to participate, but without developers we wouldn’t make a lot of progress. So we began by asking developers to volunteer to be the anchor for their teams. This is a crucial moment as it requires a bit of courage and confidence to raise your hand and say, “I’ll lead a team,” among a room of strangers. But our participants embraced the chance and we quickly assembled our teams by pairing experienced developers with amateur coders, graphic designers, project managers, and even mentors/coaches from the industry. The result was three well-balanced teams banding together to work on a product over the next 28 hours. Kennedy Loftin from the Montrose Center briefs our teams on the data sets and challenges. With the teams established and ready to work, our partners from the Montrose Center briefed the teams on the data sets and challenge questions. The Montrose Center is a core organization providing resources for the LGBTQ+ community in Houston. They offered two data sets for the Hackathon participants to work with: One for LGBTQ+ resources in the community at-large and one specifically for crisis support for LGBTQ+ homeless youth. While the Montrose Center had painstakingly compiled this data, it wasn’t as actionable or widely available online as they would like. The Hackathon teams jumped to work tackling these challenges: how do we take these data sets and create a product that will help the target audience quickly find what they need? The Queerth Dimension gets right to work! Once the data sets and challenges were reviewed, the teams were off! Keyboards began clacking, Post-It pads flipping, and graphic designers sketching; the level of immediate productivity is always astounding at these events. As I circulated around the room to check in with the teams, I saw them quickly self-organizing (a trait we highly encourage in the software development field), and bantering back and forth like they were long-time friends--each fully applying their unique skill sets to help move the team forward. Partial Credit collaborating and building. As the day progressed, text editors filled with lines of colorful code and git commits started surfacing. Colored graphics and logos came into focus and website wireframes were stood up. Products quickly came together as the teams worked into the night. The next day, we reconvened and as the teams put finishing touches on their products we assembled our panel of judges: Two experienced technologists from industry, an oSTEM student member, an oSTEM Board member, and a partner from the Montrose Center. Finally, it was time for demos! The Queerth Dimension demos ArmadillX. Demos are the culmination of every Hackathon, as teams their work and show off what they’ve built. First, we had “The Queerth Dimension” walk us through “ArmadillX”, complete with “Mille the Armadillo”, a chatbot persona that helps people find LGBTQ+ resources in an interactive, natural language manner. This product's branding was very well polished with a website, the chat app, and even fliers to distribute around town with rainbow Millie avatars on them! Spectrum Developers LLC demo This Is Houston. Next up was “Spectrum Developers LLC” with their product “This is Houston”, a novel approach to a community organizing effort to assist LGBTQ+ folks who want to engage more with their communities. They added a powerful, filterable mapping component to the product and even had additional innovative add-ons such as wristbands with the product website so users could wear their support freely but not in an overly conspicuous manner that might inadvertently out a potential user. Partial Credit demos Identity Quest. Finally, “Partial Credit” presented “Identity Quest”, a featureful mobile app and website that collated the Montrose Center's data sets with many ways to search and sort to find the perfect resource. It even included an “Escape” button that allowed users to quickly exit the app to a search engine screen if a passerby might discover what they’re browsing. The attention to privacy and discretion with these products are traits the industry could use a lot more of. The demos were powerful, with each team displaying brilliance in the creativity of their products and courage in the delivery of their pitches, making sure everyone got a turn to speak or contribute in a meaningful way. But more than anything, I am so proud of the diversity among the teams. The young faces at the front of the room during the demos reflected more of what our technology communities must look like. Faces of different colors, fluid gender identities, and sexual orientations entirely their own -- all in a safe space dedicated to creating, coding, and producing something new and valuable to the community. 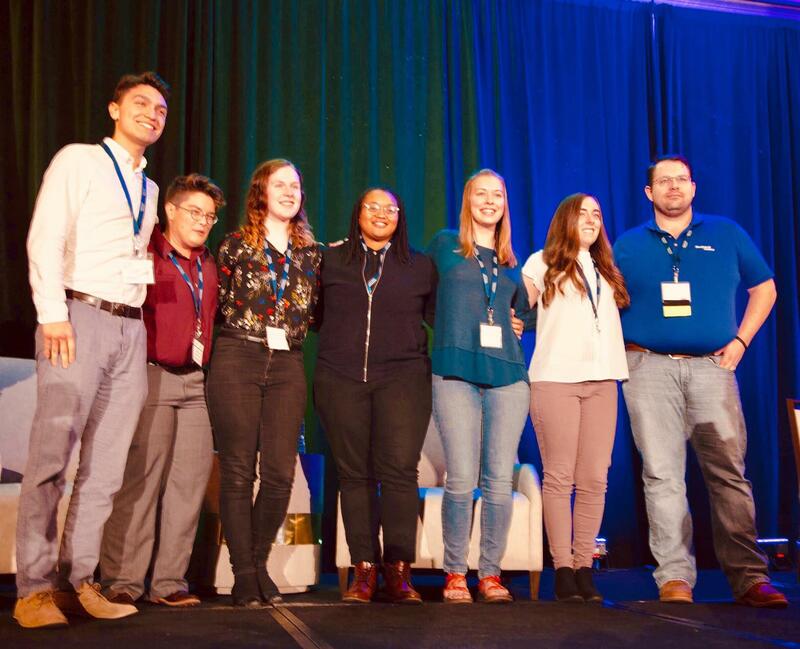 Our industry partners and I would absolutely love to have any of these participants on our production teams as they take their place among the professional ranks in the coming STEM workforce. "I am so proud of the diversity among the teams. The young faces at the front of the room during the demos reflected more of what our technology communities must look like." At the end of our two days together, we had a lot of fun, made some new friends, and shipped some very cool prototypes that the Montrose Center can continue to develop for the Houston community. That’s the definition of both a successful Hackathon. The brilliance, skill, and courage I saw from our members over the course of the Hackathon left me hopeful that the future of our queer technology community looks very bright indeed. You can join us as we do it again next year! Keep an eye on oSTEM.org and make plans to attend the 2019 conference a day early and roll up your sleeves alongside a hackathon team of your own. Help us spread the word to encourage more participation and connect with sponsors interested in supporting the next generation of queer technology leaders. We’ll see you next November in Detroit!